First, the winner to Perricone Cold Plasma cream is Kellie of Beauty is in the Eye of the Beer Holder. Congrats my dear! Please e-mail me your shipping information. Romantic girlie lace continues to make headlines. Although I consider myself a girlie girl, lace is really not on top of my must have items. However, looking at some of the collections for Spring/Summer 2010, there are definite pieces which I may consider for moi. Chanel via style.com --- I like the crochet dress on right. It has the lace idea but not the physical all over lace. This idea is definitely more my cup of tea. 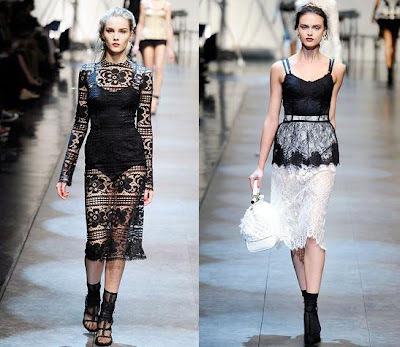 Both via Dolce & Gabbana via style.com --- so stylish! While at Target to buy miscellaneous household products, I just had to check out Rodarte for Target. This lace and tulle skirt is on top of the lace trend for only $29.99. I didn't buy it because it didn't sit well on my waist. right Diane von Furstenberg white lace dress $425 --- I have a similar dress by Ella Moss which I wear with fitted denim jacket during cold days. Vera Wang, my favorite wedding gown designer, is on the lace band wagon with this lace coat. It is quite stylish and feminine but my clumsy self will snag the coat by running into things. I can just see this poor coat with snags everywhere, $1450 via Neiman Marcus. 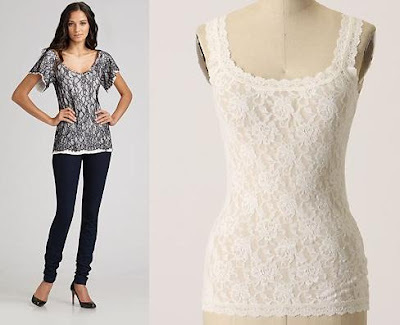 Are you a lace type of gal? I love lace so much...so girly...so classy...so romantic...etc! I love love love lace, I need more of it in my life. I LOVE LOVE LACE! I agree with daisychain. Need more of it in my life. I've been buying a lot of trompe l'oeil lace. 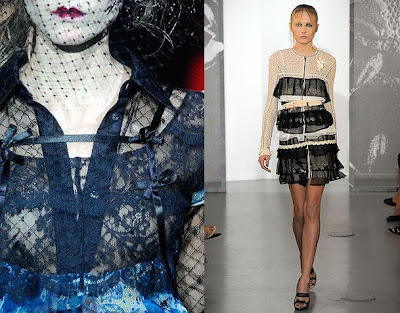 Love lace...that Rodarte for Target skirt is so cute and that Vera Wang coat is to die for! I love lace, bows, ruffles, etc. I'm a girly, girl, I guess. Love the lace coat. And yes the lace and girly look is a grower. Reminds me of my best tights when I was a girl. I'm beyond obsessed with lace. love it. What beautiful styles that are coming out! I love all of the lace. I loooove black lace. Though I very very rarely wear it as outerwear. I'm seeing a lot of lace everywhere. Even Forever 21 has an abundance of lace items. i LOVE love LOVE lace! and that rodarte skirt is so cute. i considered it when i saw it at the store, but didn't like the color with my skin tone :(. just wanted to pop by and say hi and thanks for stopping by my blog. I'm not so much a "lace" type of gal as a "lingerie-inspired" type of gal. Nothing makes me happier than modern fashions return to a retro look. Love all of these!!!!! Target is really beefing up their style eh? I am not a lace girl. Chanel is so inspirational for Spring/Summer. I want clogs and something frilly and feminine, STAT. i love lace but i tend to draw the line at the whole outerwear looking like underwear trend; i would go for maybe something more casual when it comes to lace like lace trim on a skirt or top But I am crushing on topshop's black lace blazer. It's such a cool idea! Your post made me realize that I need more lace in my wardrobe. I like lace in small doses. I bought the Rodarte for Target sheer lace tee and I just love it. But anything more than that is just too girly and romantic for my tastes. 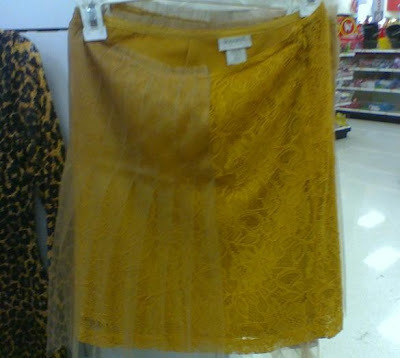 i bought that rodarte for target skirt! Lace is so beautiful, but it's so hard to find items that I would actually wear. All I ever see are the cheap, lace shirts that you know just look, well, cheap. I will keep my hopes up though that somewhere I will find some reasonably priced lace items reminiscent of these!